So Hubby was extra nice this year for Christmas. He went WAY over budget and I’m not complaining one single bit. He bought me a ROOMBA!!! I was so excited I could do the Rumba!! For those of you who might not know a Roomba is a vacuum cleaner that works all on it’s own. I know. Too wonderful to believe, right? I sure thought so. 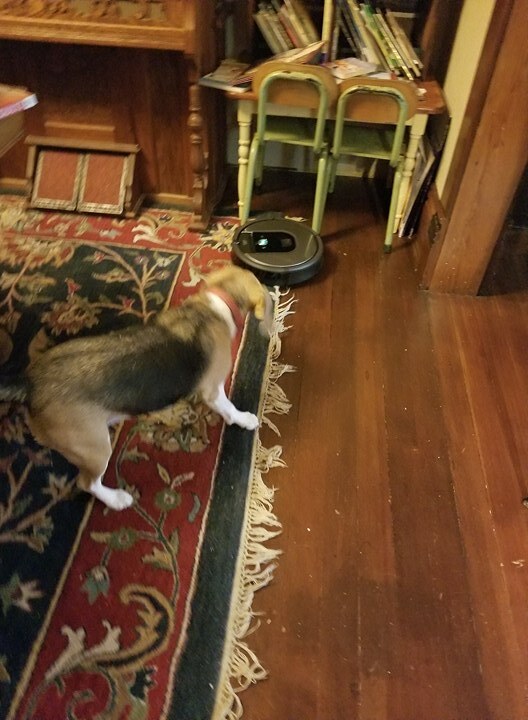 Here’s a link to the one I got the Roomba 960. 3-ya, right? could they really work. Well Hubby had our son pick one up and he got a really good deal on it….Hubby gave it to me and I was still pretty skeptical. Ruby was too…. The pictures I took aren’t the best as every time Ruby was flinching to get away from it. See? It goes right over the floors with no assistance from me. I can set it, using my smart phone, to vacuum overnight while we are sleeping. If I’m in town and Hubby calls to tell me company is coming. I can make it start vacuuming. CRAZY, I know!! The Roomba can remove itself from a docking station and it can put itself back on the docking station. MARVELOUS! It seriously does an excellent job. Hopping over my rugs wasn’t a big deal at all except for my living room rug. It’s extra plush. I can lift it, set it on the rug and push the spot clean button and the rug will be done in no time at all. I’ve waited to write about it as I wanted to be sure I really loved it and it worked over a length of time. I do love it…and so far, no problems at all. It was so funny…the thing would vacuum and Hubby and I were mesmerized standing there and watching it. I started joking with him that “I thought this was suppose to save us time”…so far we spent just as much time standing there and watching it as we would have it we were actually doing the vacuuming!! HA! I know this is a “too much information photo” but look. 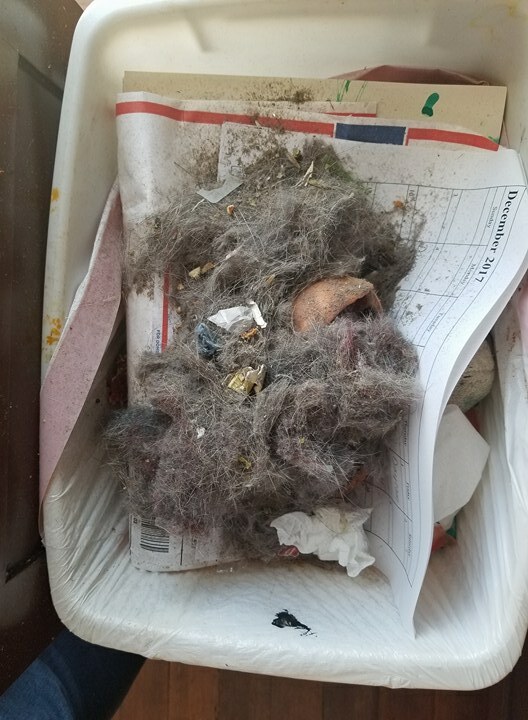 The Roomba picked up all of this in one vacuuming! Well that’s a lie..kind of. I had to stop and dump it in the middle of the cleaning. I have so been fretting about Ruby shedding like she does. I feel like people who see all that dog hair in my house won’t think I actually clean. I do. I vacuum most every night. It’s gotten to be so annoying. This Roomba is a needed thing for me if I’m running a childcare business out of home. I couldn’t be happier! I’ve had it since Christmas and I HIGHLY recommend it. Boy I wish I had this when I was having shoulder issues. Who knew? I really does work. I’m starting to feel like “Jane Jetson” from the cartoon the Jetsons! I have a vacuum that vacuums for me just like Jane would. This entry was posted in Uncategorized on March 13, 2018 by Jo. I can’t think of anyone more deserving. Vacuuming every night sounds like my version of he—! Isn’t new technology marvelous! A friend of mine told me a story about the people she baby sits for. The Roomba was vacuuming one afternoon. It went into the closet came out with a step ladder slinging it in circles. She stopped it got the step ladder out of its (mouth). 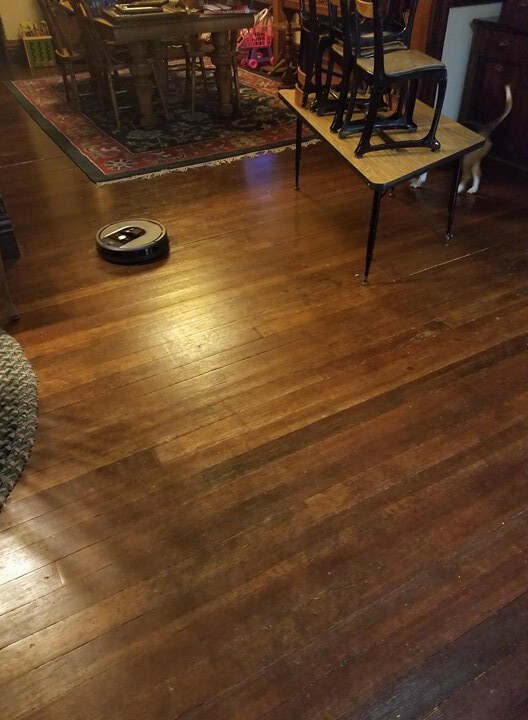 Put the step ladder up turned the Roomba back on and it proceeded to vacuum again. Once again it went into the closet and grabbed the step ladder and started slinging it in a circle again. It must have some powder. I had one when they first came out. It wasn’t as good about hopping from wood to tile to carpet as they are now. But I really did like it. I’ve got one in my Amazon cart and will get it one of these days. Things could definitely be a little cleaner around here. I read an online story about a family that had one and it ran overnight. Well they had a small puppy that left a small pile one night and the vacuum carried it ALL over and then their little toddler came into the bedroom and climbed into their bed(with the feces all over his feet). I laughed so hard at the story and how it was told. Can you imagine?! I am still laughing at these stories…..the step ladder and the puppy/toddler. Oh my! Jo, thank you for telling us about this. I have a dog that sheds a lot (short white hair!) and we have a dirt driveway too. Everything shows on the hardwood floors plus we have rugs and tile in kitchen. So glad to know it will clean it all. I am just so tired of trying to keep up with it all…. How does it handle the fringe on your rug? How does it work around table and chair legs? If only it would make my OLD floors look like new! LOL If you have had such good results and I see on your blog that you have a lot of foot traffic in your house it must work. Jo, you are the second person I know who got one for Christmas and loves it! I LOVED the Jetson’s as a kid! 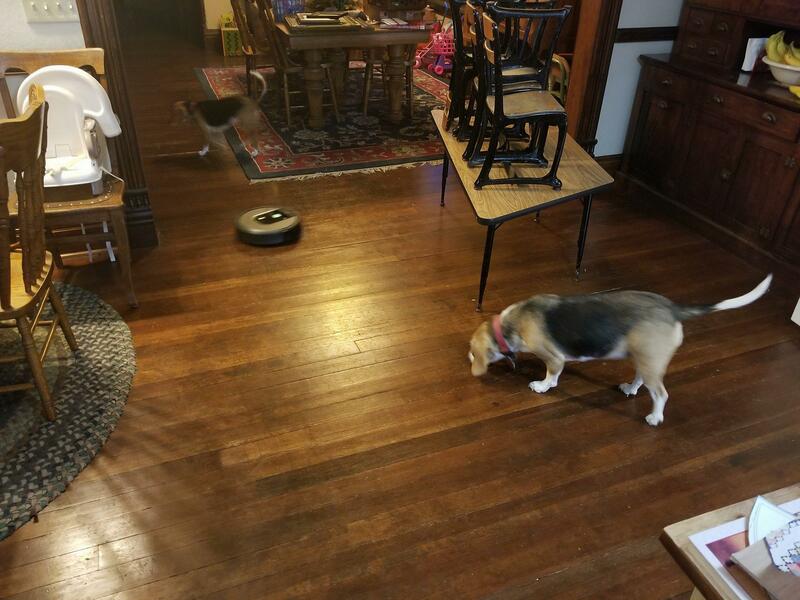 Can you imagine what our grandmothers/great grandmothers would think of Roomba? Science Fiction! Thanks for sharing! Aww, hooray! I got one for Christmas about six years ago, but it finally bit the dust (hehe) the other day. Oh, how I miss my Roomba. Hubby got me a Dyson cordless to replace it, so I’ll take what I can get! I hope you enjoy it for many, many years! I am always amazed at how much the Swiffer picks up after I sweep. I may have to put that on next Christmas/birthday/anniversary.